Barrydowne Animal Hospital in Sudbury, ON – Visit Barrydowne Animal Hospital in Sudbury, Ontario! Your local Animal Hospital that will care and look after your pet family member. Contact us at (705) 566-4243 to set up an appointment! Welcome to Barrydowne Animal Hospital. We are conveniently located on Barrydowne Road, in Sudbury. We have been serving pets and their families in the Sudbury area for over 48 years. Contact us at 705-566-4243. We look forward to your visit. A client-centered small animal practice in Sudbury. The staff at Barrydowne Animal Hospital in Sudbury know that your pets are important family members, and we believe that your family’s dogs and cats deserve and require veterinary care that will provide them with a healthy lifestyle, enabling them to lead longer, happier and more comfortable lives. We work tirelessly to ensure that both pets and their parents are as happy and healthy as can be! Need to see a Vet? Request an appointment online, quick and easy. If your pet needs medical assistance, you can feel confident turning to us. Our experienced veterinarians provide many surgical services at our clinic. We share the same goal – ensuring your animal companion is healthy and happy.Haven Animal Hospital is pleased is to provide a library of professionally written articles updated by practice experts and reviewed by practitioners to bring you the most up-to-date, trustworthy pet health information. We are happy to book an appointment for you. Quickly and easily schedule an appointment time that is convenient for you and your pet. Your online pet portal is your one stop for appointments, medical records and more. Learn more about the staff at Barrydowne Animal Hospital! Dr. Danyluk had a passion for animals from an early age. Her family would tease her because although she'd watch graphic human surgeries on tv with clinical interest as a young child, she inevitably ended up in tears whenever an animal got hurt or died in a movie. Born and raised in Sudbury, Ontario, she completed her Bachelor of Science degree in Biomedical Biology in 2002 at Laurentian University, followed by a Doctor of Veterinary Medicine degree from the Ontario Veterinary College in Guelph. She was accompanied by Sammy, her senior Poodle mix. Upon graduating in 2006, she returned to Sudbury to practice veterinary medicine. 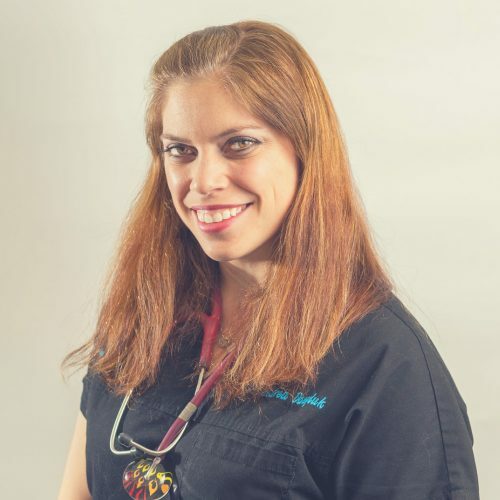 Dr. Danyluk has a special affection for senior pets and devotes much of her time to ensuring that they lead full and active lifestyles, free of pain and discomfort. Her work as a Certified Canine Rehabilitation Therapist has enabled many of her senior clients to feel better, creating an improved quality of life for both pets and their families. She believes that all senior pets should enjoy their golden years. 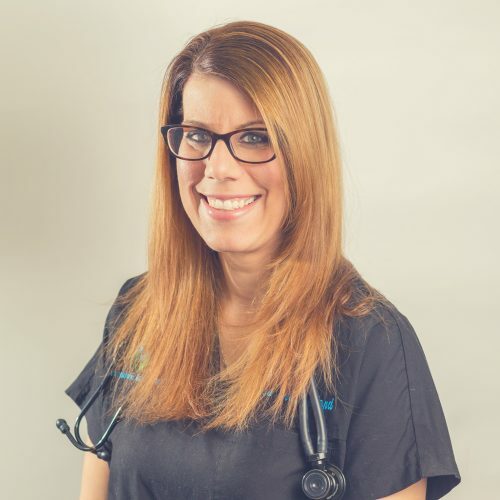 Dr. Danyluk lives with her husband, daughter and son, and a Rhodesian Ridgeback named “Super Cooper.” In her spare time, Dr. Danyluk enjoys playing with her kids, running on Sudbury's beautiful trails, and going for motorcycle rides. Dr. Chamberland was drawn to biology from an early age, but wasn't sure if her patients would have two or four legs. In her last year at Laurentian University, her dog Jessie was struck by an out-of-control car while Dr. Chamberland was holding her leash. Fortunately, Jessie survived. The attending veterinarian allowed her to observe Jessie's treatment, and Dr. Chamberland found her calling. After completing her studies at the Ontario Veterinary College in Guelph, Dr. Chamberland returned home to Sudbury to practice veterinary medicine. Dr. Chamberland finds great satisfaction in performing non-invasive diagnostic techniques to find answers for ailments that might otherwise go undiagnosed. She completed specialized training in ultrasonography in 2008. Dr. Chamberland shares her home with her husband and two daughters. She enjoys camping and exploring Ontario's beautiful provincial parks. A long-time Ukrainian dance instructor, she and her daughter can usually be spotted at many of Sudbury's festivals. Her furry family is comprised of a Jack Russell Terrier named Jenn who came into their home as a foster pet while recovering from a broken leg. She won their hearts quickly and has been a permanent member of the family ever since. Jenn’s best friend is a grey tabby named Tigger who is very affectionate but will definitely let you know when his food bowl is empty. Dr. Reed always had a deep love for animals and a passionate curiosity for science. She began working with animals as soon as she was old enough, and developed a varied résumé that included working at a zoo, helping the visually impaired with their seeing-eye dogs, demonstrating animal care to children at a science museum as well as a reptile education centre, working with marine animals, and even grooming animals in a pet salon. Dr. Reed studied biology at Reed College in Portland Oregon, and then completed a Master's degree in Biology at Bowling Green State University. She also did coursework and research for a Masters degree in Public Health (specializing in Veterinary Public Health) but was accepted to the Ontario Veterinary College in Guelph to begin her veterinary degree before she completed her public health degree. In 2013, she moved to Sudbury to start a new adventure. Dr. Reed has special interests in surgery, internal medicine, ultrasonography, and public health. Dr. Reed lives with her husband and son, and has two adult step-children. She has three dogs; Megabyte is an older gal and looks like Petey from The Little Rascals. Terabyte has a heart shaped nose and was a Parvovirus survivor at a clinic at which she was working during her final year of studies in veterinary school. Nanobyte is a goofy, shy Great Dane puppy who was delivered by Dr. Reed's own hands in summer of 2014. In her spare time, Dr. Reed enjoys going on adventures with her son, cooking, traveling, doing various crafts and running, as well as working on her French with her in-laws.